MEDICAL COSTS SINCE JULY 2013: $4,436.38 PLEASE CONSIDER MAKING A DONATION! 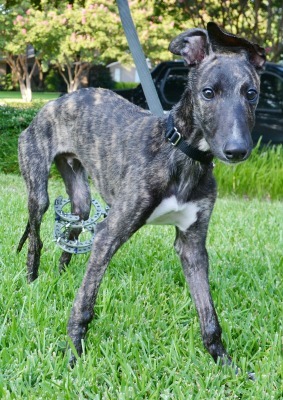 Timmers, aka Tiny Tim, is an approximately 7-month-old dark brindle male. He arrived at GALT via Paws of Paradise Orphanage as a 3-month-old(see their message to GALT below). Timmers, as he has been re-christened by his foster mom instead of Tiny Tim, has a previously broken leg that has been x-rayed by Dr. Jeff Ellis of VCA Preston Park Animal Hospital. Timmers' injury is old, most likely when was a very, very young puppy as it is healed completely now. His tibia has been completely broken, and he is being referred to Dr. Bob Radasch of the Dallas Veterinary Surgical Center for further evaluation. The rescue email: "Hi, we are a dog rescue & we have acquired a 3 month old (approx.) 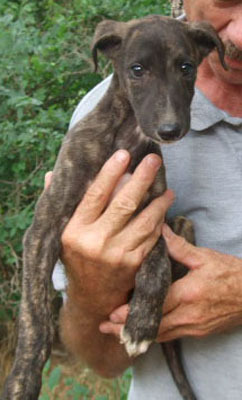 Greyhound puppy. We got him from our veterinarian who has a client that races them. This pup's left hind leg at some point in his little life was broken...and no one noticed it until it has already healed itself. They couldn't use him to race, so they dropped him off at the vet to be euthanized. AAAAHHHHH!!!!!! He gets around just fine. He can walk & run. He has trouble standing on his hind legs. I mean like when he puts his front paws on the bed, his hind paws have trouble holding him up, but other than that he's fine. We call him Tiny Tim, after the Dickens character. He can look SO somber sometimes. When I took him back to the vet to be neutered, I think he thought I was returning him, like he was being rejected again. I felt so bad & assured him I would be back for him. Now he picks up toys and runs with them. He's got a wonderful disposition." Dr. Radasch has surgery scheduled for little Timmers on August 8. Because of the complexity of the healed fracture, a custom made external fixateur will be implemented. He is hopeful that Timmer's growth plate will not be affected adversely. Dr. Radasch reported that Timmers' surgery went well today. A full circular external fixator with four rings, constructed and designed by Dr. Radasch, was implanted. Timmers will be staying at DVSC for the next 4-5 days so he can be closely observed. The device will be adjusted slightly three to four times a day for these first few days and possibly weeks. Dr. Radasch is optimistic that Timmers' leg will be able to be put back in a straight position with a normal quality of life as he has good growth plates at the top and bottom of the his tibia. The staff at DVSC has fallen in love with this little guy! Because of the complexity of Timmers' surgery, his stay at DVSC was 12 days, not the originally planned 4 or 5. The custom designed external fixator device was adjusted twice a day until it was at the desired placement position for healing. Timmers' estimated cost of surgery is in excess of $4500 at this time. 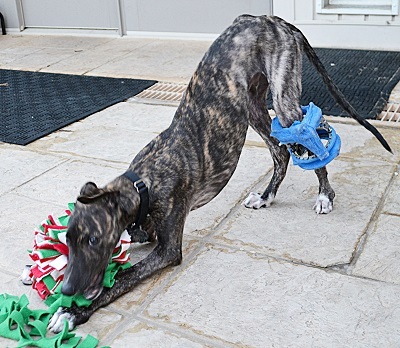 Timmers is being kept very, very quiet in his foster home (no small feat for a young pup!) Please, please help with Timmers' surgery cost! 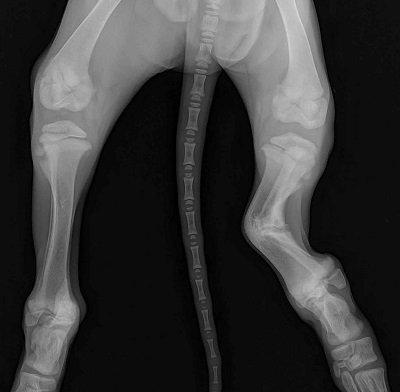 Dr. Radasch has released Timmers to available based on x-rays which show the bone to be completely healed!